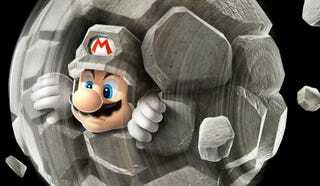 What new flavor of mushroom does Super Mario Galaxy 2 offer? The delectable rock 'shroom, which gives Mario the ability to turn himself into a boulder and bowl over Bowser's minions. That just one of many power-ups highlighted in this new trailer. The familiar Super Mario Bros. staples—Fire Flowers, Starman—join the most recent Super Mario Galaxy super powers, including the ability to become Bee Mario and Ghost Mario, in this new gameplay video, as does one more new skill. That one is for the ever reliable Yoshi, who can now chow down on bulb berries and light platforms previously unseen. It's the fireball effects on that giant snow Bowser, however, that has me most excited to return to Super Mario Galaxy. The sequel hits North American Wiis on May 23.